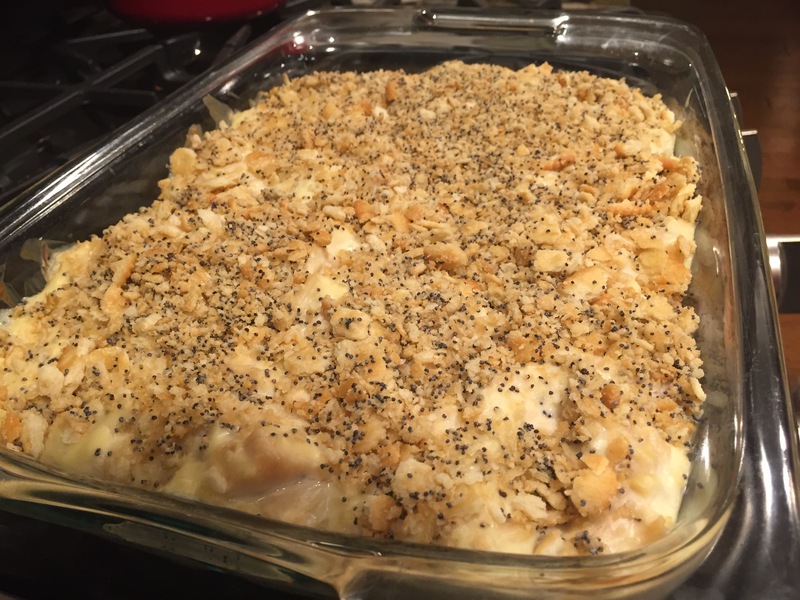 If you’re looking for an easy weeknight meal, try this recipe from our Aunt Robyn: Poppyseed Chicken. I prepared it this evening so I could try it out for the family cookbook and take some pictures. It was so easy, I asked Robyn if I could share it with you all too. She told me this was the first dish her son asked for when he returned from the war I. Iraq so you know it’s gotta be good! Put the crackers in a large ziplock and smash them with a rolling pin. Mix them with the melted butter and poppyseeds. Line the bottom of a 9×12 Pyrex pan with half the cracker mix. In another bowl mix together the soup and sour cream. Stir in the cooked chicken. Mix well. Spread the chicken mix over the crackers then top with the remaining crackers. You can cook and diced the chicken ahead of time to speed up the assembly even more. Or use premium canned chicken in water rinsed well. I made the whole thing in the morning so I could just put it in the oven when we got home – dinner in a half hour. I also made some rice to eat with the chicken. Robyn advised me that poppyseed chicken should always be eaten with broccoli. None of my boys like broccoli so I melted some cheese over it, which makes all veggies more palatable! It was a complete meal enjoyed by all and put together pretty easily – a great combination for a week night.